Our services are used by architects, quantity surveyors, project managers & building contractors. We work very closely together on developments and endeavor to take the hassle out of applying signage to a building or development. As all sites are not identical, whether it is internal or external, each unique requirement is catered for in the Signkor product range, which includes the services of an in house professional team comprising of project managers, sales team, design team, architectural draftsman, engineering specialists and a strong administration team. We are able to advise and create each unique installation using our product range and experience in the field. Our services range from decals to pylon’s, neon and LED illumination, fabricated lettering, steel, aluminium and stainless steel, including Perspex, brass, chromodek and supawood. There is no project too big or too small that we are unable to manufacture or install. We strive to supply a maintenance free product with high impact and visibility. 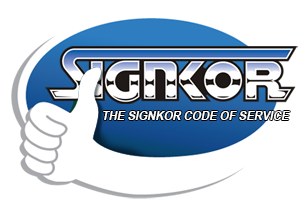 We tailor make a product that fits within your budget, THUS PROVIDING YOU WITH THE SIGNKOR CODE OF SERVICE!